Baby Bowen came through his surgery GREAT! Already extubated today, which is a wonderful sign! Still praying for a fast recovery so he can go HOME! This should be his last surgery until he is 18 months to 2 years of age. Anna Reese had a GREAT day today. Tuesday night and Wednesday were very bad days… I won’t go into detail but every single prayer was needed and I know appreciated by their family. It was… rocky, to say the very least. However I just talked to Anna’s mom, and she had a GREAT day today, so PRAISE JESUS for that! And I stopped by her room for a minute and she was awake and looking around, and just looked so much better. 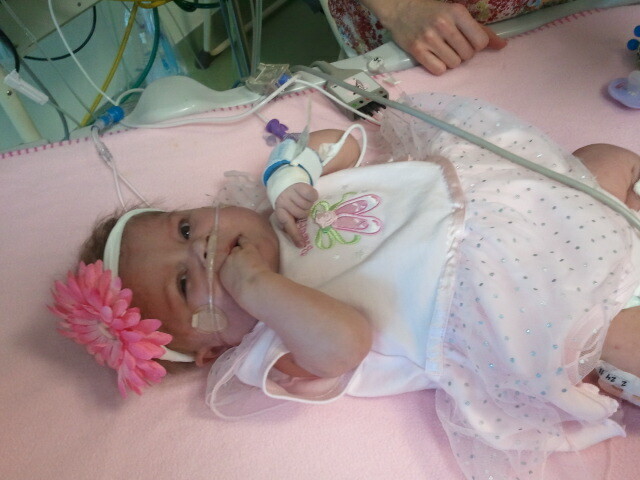 Still, she’s been through a lot, and there are a LOT of prayers still needed for this little one, so keep ’em coming! Annabelle had a great day too! Had to go up just a little on her oxygen, but other than that, we were status quo. She has her primary night nurse at the moment, which she and Mommy LOVE, and is snoozing away in her crib wearing cute new Jammies nurse Ashley got her! AND Daddy got to come spend a good bit of the day with Annabelle too, which is always a fun thing too!! Today was a great day in another way too, because MY GABBY CAME HOME!!!! OH my goodness I missed her! We hugged and giggled and gave kisses and tickled and yeah. Mommy really needed her Gabby, and Gabby needed her Mommy too! Gabby and her sisters had a great reunion as well. It was a good day in the Phillips’ home. And TOMORROW will be a great day TOO! Tomorrow, my sweet sweet Lacy turns 7 years old!! MY what a big girl she’s getting to be! My Mommy heart is just overflowing today. Sisters are SO SO happy to see Gabby! Group Hug! Annabelle with her PINK flower bow and ballerina outfit! 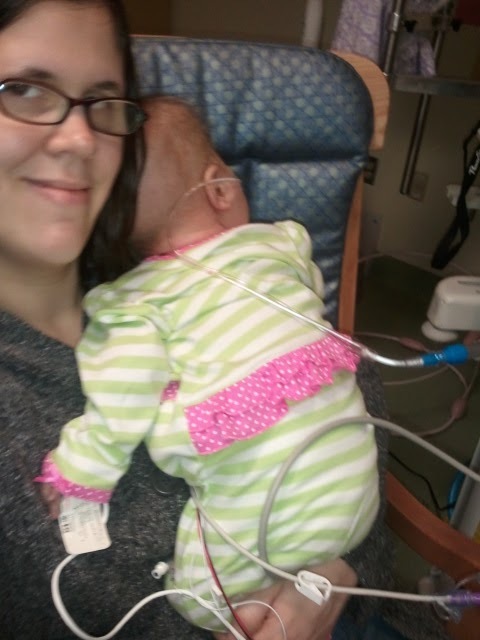 Annabelle, sporting her cool new jammies, snuggling with Momma! Good to hear the update. Annabelle is such a cutie!! Happy birthday to Lacy! I'm so happy Annabelle and her heart buddies all had such great days. How wonderful to have your Gabby home. My heart is warmed to know you've been having some great days. Been thinking of you a lot lately. Praise God for such excellent news on all fronts! I'm so glad you all had a good day! Happy birthday to Lacy!! Thank you so much for the update, I am happy to hear that everyone is doing better! I will continue to pray. So happy to hear that Gabby is home! Happy Birthday Lacy! My little one had those pajamas too and I love Annabelle's outfit, precious! Praise God for answered prayers! God is good, all the time and all the time, God is good! I love to see the photo of Annabelle in your arms. That's the way it should be.